Perfect for beachside parties, scavenger hunts or long nights alone. Oxenfree's soundtrack is an electronica daydream that fades into a bumping nightmare; it's the aural interpretation of the sun setting over an abandoned, beachside military base packed with deadly secrets. In other words, it's perfectly suited to the game's haunting storyline and award-winning visual style. 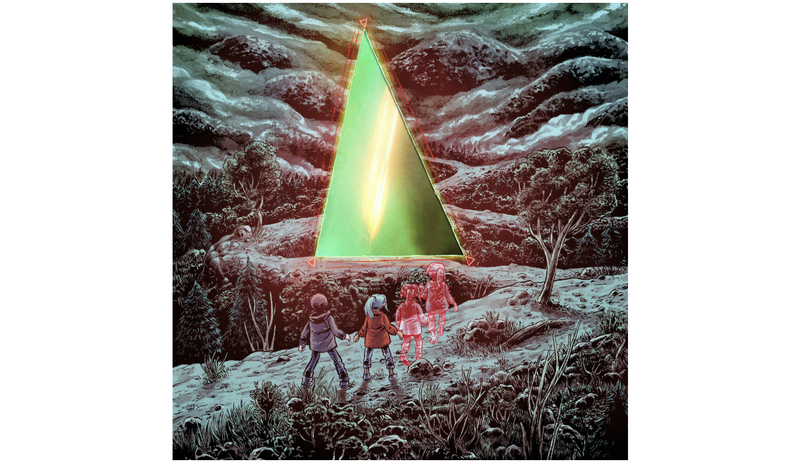 Thanks to iam8bit, the Oxenfree soundtrack is now available in vinyl form, including art from comic illustrator Austin James (Wet Brain) and a holographic portal on the front cover. The double LP vinyl set costs $35 via iam8bit and it should ship in September. Anyone who buys it will also be emailed a download code for the digital album in early June, once mastering is complete. Get a taste of the soundtrack, created by veteran video game composer Andy Rohrmann (SCNTFC), on Bandcamp. Oxenfree hits PlayStation 4 on May 31st complete with a New Game+ mode that expands the narrative even after players have finished the game. Steam and Xbox One versions will also receive New Game+ on May 31st in a free update. Oxenfree is $20 across all platforms, but it'll be $15 for PlayStation Plus members in a launch month sale.